Concerns about security at English soccer games grew Sunday after incidents at Birmingham City and Arsenal resulted in two supporters arrested for leaping out of their seats and attacking players. The first incident happened in the opening minutes of the match known as the "Second City Derby" in Birmingham. A fan charged onto the field and caught Aston Villa captain Jack Grealish unaware, swinging a right arm and striking the side of his head. "I was walking into position and then just felt a whack around the side of the face," Grealish said. "Obviously there's rivalry and stuff in football but I don't think there's any place for that." 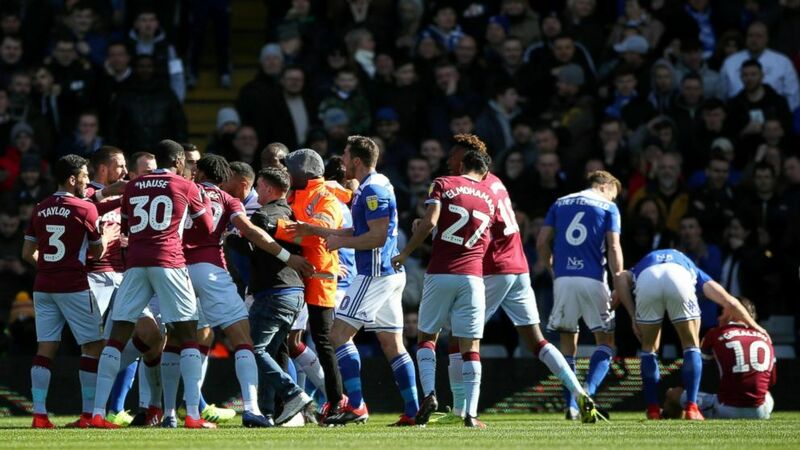 The pitch intruder — later identified as Paul Mitchell — was quickly restrained by a stadium security official as Villa players rushed to confront him early in the second-tier League Championship game. The 27-year-old Mitchell was led away by police, blowing kisses to the crowd. He was later charged with assaulting Grealish and invading the pitch, and detained in custody before a court appearance Monday. "We apologize to Jack and all at Aston Villa Football Club," Birmingham said in a statement. "What happened has no place in football or society." Hours later in the rain of north London, after Pierre-Emerick Aubameyang scored Arsenal's second goal from the penalty spot in a 2-0 Premier League victory over Manchester United, a supporter darted onto the field. As he raced toward the celebrating Arsenal players, he pushed United defender Chris Smalling. "It's obviously a concern with the one earlier today," United's Ashley Young told beIN Sports. The Metropolitan Police said a man was in custody on Sunday night after being arrested on "suspicion of common assault and pitch invasion." Arsenal said the man would be banned from its games — home and away. "We utterly condemn the behavior of the individual who ran onto the pitch and approached Chris Smalling," Arsenal said in a statement. "We would like to apologize to Chris and Manchester United, and are pleased that the individual was apprehended and arrested. We will be working closely with the Metropolitan Police in their investigation." In Birmingham, Grealish responded to the violence by scoring a second-half goal that secured a 1-0 victory for Villa. But he was booked for jumping into the stands to celebrate with visiting Villa fans. "I just tried to get on with my job," Grealish said. "To score the winner was unbelievable, after what happened in the first half I think it was set up for it." The competition organizer said it "condemns the mindless actions" of the man who attacked Grealish. "It's a situation no player should ever be faced with," the English Football League said in a statement. "In all circumstances the playing surface is for players, not supporters. Those playing in the game must be able to do so safe in the knowledge they will not be subjected to this type of behavior. "We will work with all the relevant parties to address the issue of player and match officials safety on the pitch and ensure the appropriate action is taken." Birmingham said it would assist the authorities in their investigations and review stadium safety procedures. Precautionary measures were already taken in an attempt to reduce the risk of violence. "We kick off on Sunday at (noon) for a reason, to keep the people out of the pubs," Villa manager Dean Smith said. "Security's got to be ready for people coming on to the pitch but then some lunatic goes on trying to make a name for himself." The attack followed a number of recent high-profile incidents of crowd trouble north of the border in Scottish football. In a Scottish Premiership game on Friday night, Rangers captain James Tavernier found himself face to face with a Hibernian fan who had jumped out of the home support stand. The previous weekend a glass bottle was thrown from the same section of the stadium as Celtic winger Scott Sinclair prepared to take a corner kick during a game at Hibernian.